Clayton Waite (Snuffy) Smith, Cmdr. USN, Ret., 84, of Pascagoula, Miss., died Monday, April 12, 2004, at River Chase Village Nursing Home in Gautier, Miss. He was born March 19, 1920, in Bellevue, Pa. and was raised in Schenectady, N.Y. Cmdr. Smith was a member of St. John's Episcopal Church, Pascagoula, Miss. He graduated from the U.S. Naval Academy, Annapolis, Md. in 1943, and retired in 1967 as Commander. 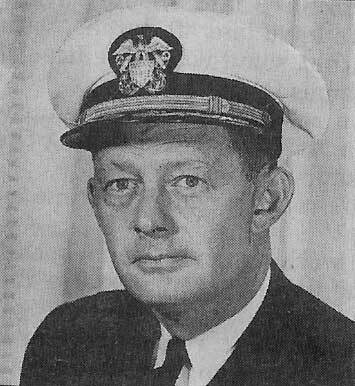 During his naval career, Snuff was Executive Officer of the USS Skagit, and commanded the USS Catamount and the Flotilla One. Later he was employed by Rockwell Industries in the space program, then by Litton Industries, transferring to Pascagoula in 1971 and retiring in 1986. He was an active member of St. John's, serving as a Lay Eucharistic Minister, a Lay Reader and head usher. He was an active member and treasurer of the Brotherhood of St. Andrew chapter. He and Anne were very active in the Cursillo movement in Miss., attending Cursillo #1 and serving at many others subsequently. They fostered many young people through the Youth Court Foster Program. He was preceded in death by his wife of 51 years, Anne Kuhns Smith; a daughter, Barbara Anne Minkler; and a sister, Barbara Elizabeth Catricala. He is survived by his children: Susan Patricia Smith-Youngs, Santa Barbara, Calif., John Kuhns (Vikki) Smith, Eureka, Calif., Thomas Clayton Smith, Long Beach, Calif., Sarah Elizabeth Smith, Pascagoula, Miss. ; son-in-law, Rick (Effie) Minkler, Pascagoula; and four grandchildren; Barbara Ellen Berry, Kyla East Smith, Morgan Clayton Youngs and Vivanna Kuhns Smith. Snuff also leaves a foster daughter, Ilania Fowler of Cleveland, Ga.
Memorials may be made to St. John's Episcopal Church, 3507 Pine St., Pascagoula, Miss. 39567. Arrangements by O'Bryant-O'Keefe Funeral Home, Pascagoula, Miss.